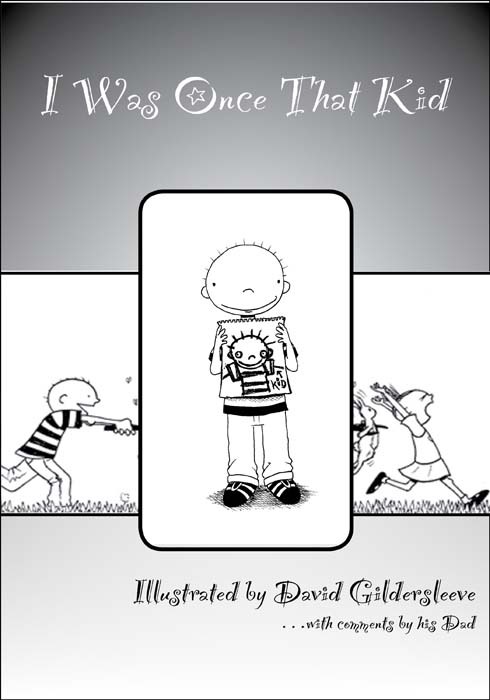 "I Was Once That Kid"
Home > G-sleeve Art > "Books" by David > "I Was Once That Kid"
This book, "I Was Once That Kid" includes 20 of David's favorite illustrations from his Being a Kid series of drawings. These are reflections on his experiences as a Kid and they are complemented with comments from his Dad (who would know the Kid better?). These reflections immediately take the reader back to the 70’s when David had to cope with everything that invaded his realm. They were happy years, and the memories expressed in his illustrations attest to that reality. David was very definitely that kid! Together, the illustrations and commentary remind the reader of their youth. After all, David’s memories simply reflect that adage that the adventures and funny moments in our younger years prove we are all connected through the magic of being children. So get ready to be enchanted with this look into the life of being a Kid. It’ll bring back memories from your youth.